A Tweet On Women's Veils, Followed By Raging Debate In Saudi Arabia : Parallels A prominent ultra-conservative figure says face veils for women are not mandatory. Now everyone is weighing in on the hottest topic in the kingdom. 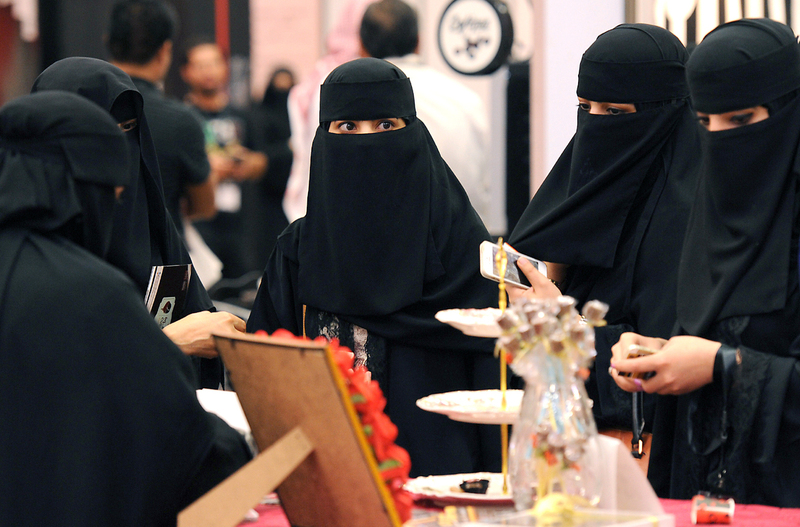 Saudi Arabian women wear their traditional face covering, the niqab, at a coffee and chocolate exhibition in the capital Riyadh on Monday. A prominent religious figure said on Twitter that the face veil is not mandatory, sparking a heated national debate. The man at the eye of the storm in Saudi Arabia is Ahmad Aziz Al Ghamdi. He's a religious scholar, the former head of the religious police in Mecca, a group officially known as the Committee for Promotion of Virtue and Prevention of Vice. He has the pedigree of an ultra-conservative. Yet he stunned Saudis with a religious ruling, known as a fatwa, that is very liberal by Saudi standards. He declared that the niqab, the black face veil that is ubiquitous among women in Saudi society, is not obligatory. His answer came in a Twitter response to a tweet he receive from a Saudi woman who had turned to him for religious guidance. She asked: Does Islam allow her to post a picture of her face on social media? His affirmative answer went viral within hours, with more than 10,000 comments on his Twitter feed that ranged from congratulations to death threats. When Twitter commentators asked, "What about his own wife?" Al Ghamdi promptly stepped up the controversy another notch. He appeared Saturday on the most popular TV talk show in Saudi Arabia. The Badria program is broadcast each week from Dubai in the neighboring United Arab Emirates, where the traditional rules for women's dress are less restrictive. Ghamdi went on air with his wife, Jawahir Bint Shekh Ali, who appeared without a face veil. She spoke to the program host, Badria al-Bishr, about her decision to show her face, not just among close family and friends, but in a broadcast that could be seen across Saudi Arabia. She covered her hair, but was wearing makeup, another point that enraged conservatives. Her husband specifically approved of makeup in his religious ruling. Ahmad Aziz Al Ghamdi, a prominent religious figure in Saudi Arabia, said that the face veil for women is not mandatory. He then appeared on a popular talk show with his wife, who was not wearing the veil, known as the niqab. The reaction on Saudi Twitter feeds was immediate and furious. Saudi Arabia is a deeply conservative society, the only country in the world that effectively prohibits women from driving. Girls and women are forbidden from traveling, conducting official business or undergoing certain medical procedures without permission from their male guardian. Gender segregation is mandatory in schools, hospitals and restaurants. Even banks have separate tellers for women. The names of mothers and sisters are not shared with others outside the family, even with best friends at school. But norms are changing as global culture is beamed into the kingdom through social media and satellite television. Education is changing expectations in a country where the majority of the population is younger than 35. Twitter usage in Saudi is booming, considered the fastest-growing market in the world, despite regular crackdowns by the religious police. Ghamdi has stirred a public debate over the face veil that is unlikely to end with the television appearance. The controversy reflects a wider debate in many Saudi households as urban, college-educated, professional women abandon the face veil as impractical in a work environment. The reaction from the top religious authorities was predictable. Saudi Arabia's grand mufti, Sheikh Abdul Al Aziz Al Shaikh, has called on Ghamdi to repent and declared that Muslim women have a duty to cover their faces. "Some brothers even took the step to show their wives in public. This is a very dangerous thing," he said in comments posted on a local news site. But the Twitter debate then erupted again, challenging the interpretation of the highest religious authority in the kingdom.